As community manager and event emcee, Davin is in charge of keeping the party going by bringing all the cool content from Future Insights conferences to the Future Insights site. 1. How did Future Insights get its start? Future Insights started as Carsonified conferences. The founder of Carsonified, Ryan Carson, sold his conference business to focus full time on Treehouse, a fantastic service that teaches you to code through interactive tutorials. Carsonified had produced tech conferences for years, so we’ve still got a ton of institutional memory and the great conference producers who made the Future of Web Design, Future of Web Apps, Future of Mobile, and Future Insights Live conferences a success. 2. How do you differentiate Future Insights and other similar events and conferences? There are a few ways. First, all we do is produce tech conferences, so we spend 100% of our time researching the right content, finding the best speakers available, and planning things to ensure people get every dime of value for the price of their ticket. Second, the scope of our events tends to be larger than others. Instead of sticking people in one room for two days, we usually plan out two or three (or five, in the case of Future Insights Live) different tracks in different rooms. This gives people more options on site. Third, we professionally record every session at our events, and make them available to attendees after the fact. This way you never really miss a thing. 3. What are the biggest problems when you are organizing Future Insights Events? There are a ton of challenges when organizing a tech conference. Many of them are logistical — you have to get the right venue, the right hotel rate, the right city — but those come with experience. For us, the biggest challenge is offering content that’s cutting-edge enough to satisfy the really advanced developers and designers without alienating people who might not be ready for the ultra-futuristic stuff. We always try to have a good mix. 4. Who do you really like in the web design field? And who is person who influenced you the most? 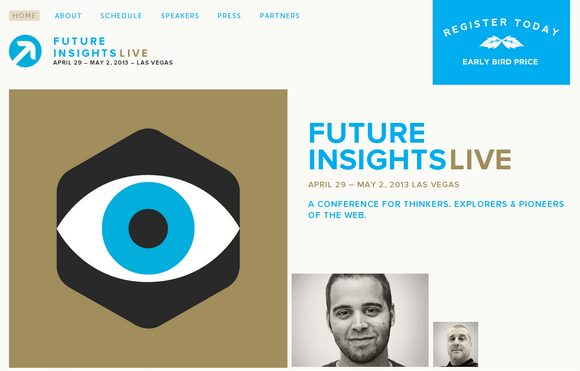 I’d have to say Mike Kus, who just completed the new site for Future Insights Live. Mike is a supremely talented illustrator and graphic designer who set his sights on bringing his artistic vision to the web. I think his sites stand out for their gorgeous illustrations and very straightforward presentation. We were extremely lucky to get him for our redesign project. After Mike, there are too many amazing designers to count. 5. What do you think is the next big thing in the Internet? MOAR CAT PIKTURS. That, and the near complete fragmentization of what we think of as “the Web.” For the first 20 years of its active life, the web was on desktops. Then laptops, then mobile devices. We’ve already seen developers and designers scrambling to figure out how to adapt to this level of fragmentization, but I think that will pale in comparison to what we’ll see when gas pumps, parking meters, billboards, and tennis shoes are fully web enabled. The demand for web development skills is going to explode in the next decade. 6. What is your plan in the near future? We’re always working on new events and new strategies to meet the needs of the next generation of developers and designers. Right now that’s mostly cool conferences and our blog, but we’ve got a few other things in the works too. Frankly, the whole Future Insights team has a pile of cool ideas in the corner, and we’re constantly launching new ones. 7. What are your hobbies besides web design? 8. If you had the superpower to change something in the world, what would it be? I would reduce everyone’s insecurity by about 75%. I’ve met so many brilliant, amazing, intelligent people who don’t recognize what they have to offer because they’re encumbered by self-doubt or fear. And that self-doubt and fear leads to bad decisions, jealousy, and animosity. I wouldn’t completely rid the world of insecurity, though, because we should all enjoy that feeling of accomplishing what we thought we couldn’t. Please don’t forget you can sign up Future Insights with “WebAppers” discount code in order to get 10% off.